Read all about what Compassionate Action for Animals accomplished this past year in our 2018 Annual Report! The annual report gives you a broader view of our 2018 programs, events, activities, and impact. Through a combination of outreach, education, and community building we encourage people to embrace their empathy and move toward a plant-based diet, and we achieved remarkable success in 2018. 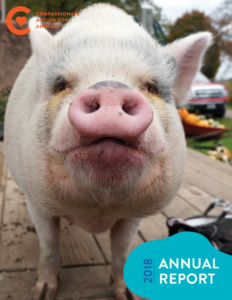 The annual report also includes a financial statement, showing our income and expenses for the year, and an acknowledgment of all of our top donors. Thanks to all of you who support our work through donating, volunteering, and participating in our events. We truly could not do so much without our community of dedicated animal advocates. The movement made explosive progress in 2018 and this year is being called the “Year of the Vegan,” but there is still work to be done. The animals need us to raise our voices and do what we can together so that their stories are heard. Together, let’s continue to live more compassionately and grow our movement in 2019 and beyond!